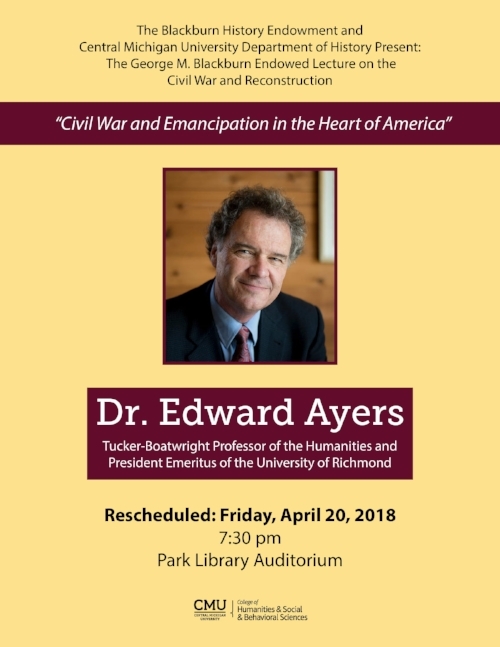 RESCHEDULED — Edward Ayers, "Civil War and Emancipation in the Heart of America"
Please note that this lecture has been rescheduled for Friday, April 20. Join us for the George M. Blackburn Endowed Lecture on the Civil War and Reconstruction by Dr. Edward Ayers who will present "Civil War and Emancipation in the Heart of America" on Friday, February 23 April 20 at 7:30 pm in the Park Library Auditorium. Open to all. 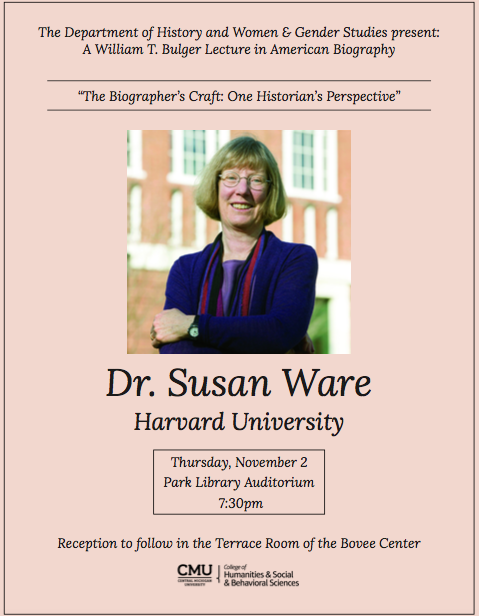 Join us for the William T. Bulger Lecture in American Biography by Dr. Susan Ware who will present "The Biographer's Craft: One Historian's Perspective" on Thursday, Nov. 2 at 7:30 pm in the Park Library Auditorium. Open to all. "A pioneer in the field of women’s history and a leading feminist biographer, Susan Ware is the author and editor of numerous books on twentieth-century U.S. history. Educated at Wellesley College and Harvard University, she has taught at New York University and Harvard, where she served as editor of the biographical dictionary Notable American Women: Completing the Twentieth Century (2004). Since 2012, she has served as the general editor of the American National Biography, published by Oxford University Press under the auspices of the American Council of Learned Societies. Ware has long been associated with the Schlesinger Library at the Radcliffe Institute for Advanced Study and is currently writing a book of suffrage stories inspired by its collections. " For more, see her website. Graduate students and Faculty are invited to a brunch with Dr. Ware on Friday, Nov. 3 from 10 - 11:30 am.